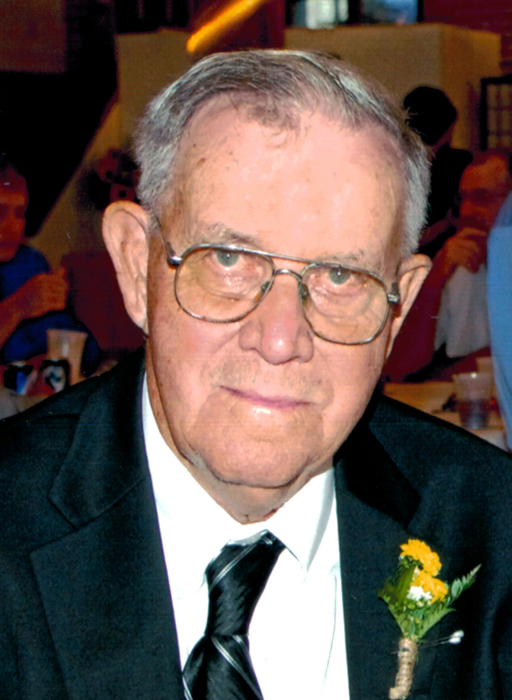 Henry L. Brinker, 88, of Washington, passed away on Tuesday, September 18, 2018 at Cedarcrest Manor Nursing Home in Washington. Henry was born on July 17, 1930 to the late Henry A. and Mary (nee, Hilke) Brinker in Washington. He was united in marriage to Grace Boeckmann on August 11, 1951 in St. Francis Borgia Catholic Church. He received his education at Ziegermeyer Grade School and two years prep school at the seminary in Teutopolis, Illinois, he later returned home and attended Rankin Trade School. Henry was employed by Zero Manufacturing for many years, working his way to production manager. After the closing of Zero Manufacturing he moved to Spartan Showcase as facilities manager, where he retired at the age of eighty. He was a member of the Hummingbird Club and a lifetime member of Washington Elks Club #1559. Henry’s greatest hobbies were farming and raising cattle. A funeral mass will be held at 10:00am, Saturday, September 22, 2018 at St. Gertrude Catholic Church. Interment will follow in the Church cemetery. Visitation will be held from 4 to 8 at Miller Funeral Home on Friday, September 21, 2018. Memorial donations may be made to St. Gertrude Catholic Church, St. Gertrude Grade School, Masses or the Alzheimers’s Association. Henry is survived by his wife, Grace Brinker; four children, Ronald Brinker and wife Brenda of Washington, Wayne Brinker and wife Sandy of Washington, Jane Copeland and husband Jim of Oak Creek, Wisconsin and Ruth Riegel and husband Doug of Krakow; two siblings; Leonard Brinker and wife Agnes of Washington and Olga Kreienkamp of Kirkwood; one sister-in-law, Irene Brinker of Washington; eight grandchildren, Jennifer Fregalette, Tim Brinker, Lisa McCoy, Kurt Brinker, Scott Brinker, Brian Copeland, Krista Brooks and Kyle Riegel; ten great grandchildren, nieces, nephews, other relatives and many friends. He was preceded in death by his parents; one son, Norbert Brinker; ten siblings, Sylvester Brinker and wife Georgia, Leander Brinker and wife Hilda, Virgil Brinker and wife Catherine, Odie Brinker and wife Florence, Orville Brinker, Eleanor Schlitt and husband Edward, Lidwina Schlitt and husband Joseph, Sister Mary Odilo Brinker, SSND, Margaret Schade and husband Gilbert and infant Mary Brinker; and one brother-in-law, Raymond Kreienkamp.